This is an extremely attractive c.1908 tourist pocket map of Paris, France. Published by Garnier Freres, the map centers on the Seine River, and covers the embastilled heart of Paris. 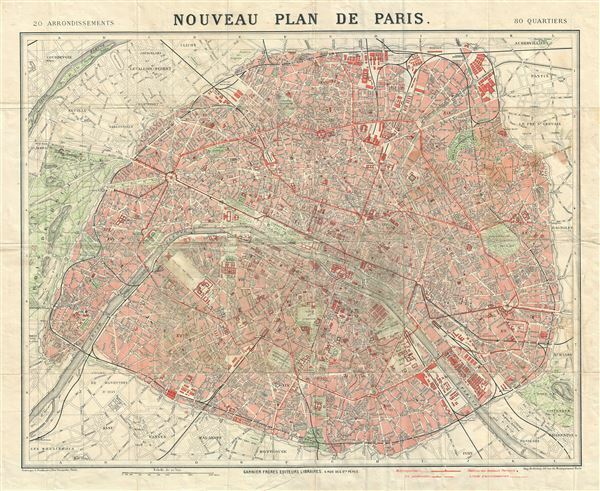 Although ostensibly designed as a subway map, this map offers much more, showing important buildings and monuments, including the Eiffel Tower, the Arc de Triomphe, Sacre-Coeur, the Pantheon, etc. This map was issued in various editions from, roughly 1900 to 1937. Though most examples are undated, we can assign an approximate date due to the development of the Metro system and the map's overall style and construction. This map helpfully also indicates lines that are under construction. In this expression of the map, line 6 is shown to be under construction between Place d'Italie and Nation, which was opened on March 1, 1909. For our purpose focusing on this extension of the 6 line, as yet unopened when this map was printed, fixes the publication date at 1908. This map was engraved by L. Poulmarie and printed by Dufrenoy. Published by Garnier Frères of 6 Rue de Saints-Peres, Paris. Very good. Some wear along original fold lines. Backed with archival tissue. Blank on verso.